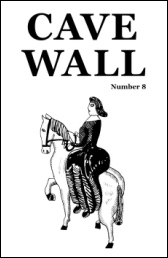 I have two poems in the most recent issue of Cave Wall, which also features wonderful new work by Robert Bly, Jillian Weise, and many others. Though Cave Wall is relatively new to the scene, editor Rhett Iseman Trull has really put together a wonderful magazine of verse. and emerging poets. Each issue includes black & white art, as well. Poems first published in Cave Wall have been featured on Poetry Daily, Verse Daily, The Writer’s Almanac, and in the Best New Poets awards anthology.